This card cannot be Normal Summoned or Set. This card can only be Special Summoned by controlling a face-up "Scrap" monster. When Special Summoned this way, select 1 face-up "Scrap" monster you control, and destroy it. 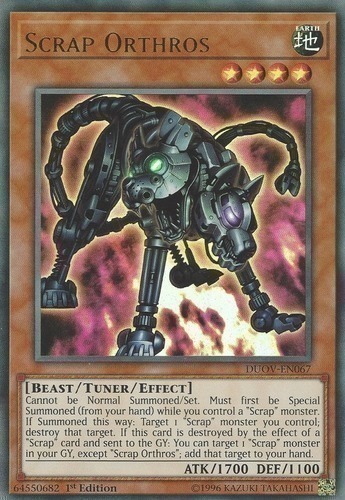 If this card is destroyed by the effect of a "Scrap" card and sent to the Graveyard, you can select 1 "Scrap" monster in your Graveyard, except "Scrap Orthros", and add it to your hand.